Decided to have a day off…. well almost. Arrived at Elly & George’s about 4pm, caught up on the news before we enjoyed a tasty BBQ with a lovely bottle of Red Pinot Noir 2008 from Tasmania, then sat giggling at the table for over an hour, with the old recipe books. It was fun. No work prepared so instead I have a different craft to share. Not my work, but the flowers were made by Elly. OK! Ok! Elly was holding up her right hand with her thumb and index finger forming a circle. That was the size of the circles. 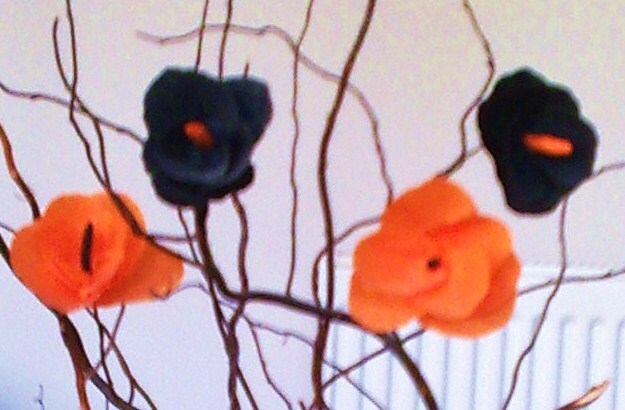 The stamen of each flowere was made in the contrast colour. A straight strip of crepe paper was painted with a glue paste and wrapped around the end of the stem. 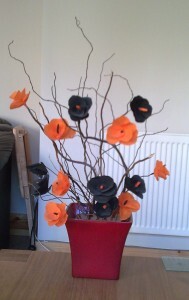 Then a circle was glued to the stem and the following one was attached from the opposite side to imitate real flowers. Continue if this manner until all seven circles are used. Hopefully by next week I will have some real Needlework for you! This entry was posted in Crafts on July 28, 2010 by Grannymar.